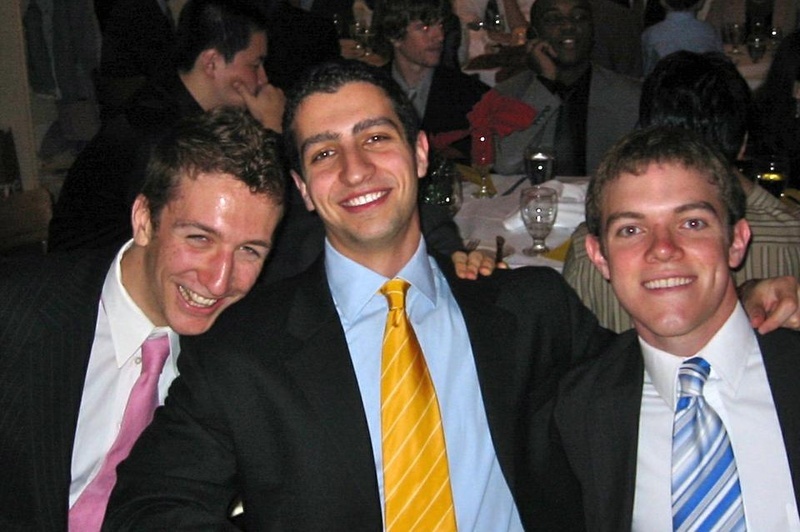 David Stearns ‘07 (center)—the Indians’ current director of “contracts, strategy, and analysis”—poses with former Crimson sports chairs Gabe Velez ’07 (left) and Alex McPhillips ’07 at the annual Kirkland House holiday dinner. Five years after graduation, Stearns has secured a coveted MLB position. It’s fall, 2003. Then-junior quarterback Ryan Fitzpatrick ’05 and the Harvard football team have just closed out a somewhat disappointing, 4-3 Ivy season with a 37-19 victory over their biggest rival, Yale. And based on the atmosphere around the field, the win appears to be adequate consolation for a season of missed opportunities. Nine years later, his former roommate and fellow Crimson sports editor Alex McPhillips ’07 laughs as he recalls the first line of that story. “Simple, straight forward—that’s a very ‘Stearnsian’ lede,” McPhillips says. In December of 2011—less than five years after the Class of 2007 graduated from Harvard—the Cleveland Indians named Stearns as one of two directors of baseball operations. Stearns is the youngest person in Major League Baseball currently occupying his post. But the former government concentrator and resident of Kirkland House noted that his youth doesn’t factor into his ability to do his job. His former roommate tends to agree. For Stearns, his appointment to the front-office position is the next step in a lifelong baseball and sports-related journey. Because he developed an interest in both the game and the industry at an early age, Stearns was able to start forging his path to the Indians’ front office long before he graduated from college. After landing an internship with the Pittsburgh Pirates during his college days, Stearns bounced around the baseball world, moving to the Arizona Fall League after graduation, then to the Mets, and eventually to a three-and-a-half-year stint with the Commissioner’s office. The Harvard graduate shares duties with Derek Falvey, who is responsible for “player personnel and acquisitions.” Falvey worked as an assistant director of baseball operations in the Indians organization immediately before the December promotion. And, according to Stearns, his new position—and working in baseball in general—is about as close to a dream job as he could hope for. According to McPhillips, Stearns showed a competitive edge and leadership qualities throughout his college career. And although his time in Cambridge may have been characterized by a straightforward, businesslike style, Stearns expressed sentimental attachment to his Harvard experience. Stearns hasn’t left Harvard behind in his professional life either. Two other recent graduates—Frank Herrmann ’06 and Trey Hendricks ’04—are also involved with the Indians organization. Herrmann—who went undrafted after playing four strong years of Harvard baseball—was called up to pitch for Cleveland in 2010 and then again in 2011. He is currently on the roster of the Columbus Clippers playing at the AAA level. After being drafted by the Arizona Diamondbacks and spending five years in the minor leagues, Hendricks has shifted his career path to the administrative side of baseball as part of the Indians’ scouting team. When he graduated from Harvard in 2007, Stearns was met with a difficult task: attempting to break into a popular industry with a small number of jobs available. But Stearns was able to overcome the odds and has settled in nicely to his role with the Indians—just in time for his five-year college reunion.